Unfortunately I’ve seen the type of behavior mentioned in the article in my own family. My degenerate brother has given over my beloved niece and nephew almost entirely to the dogs. The niece, who used to be so cute, apparently has beaten up handicapped people and bullied others for money. She apparently smokes Marijuana in the FAMILY’S garage, and fell down some stairs a few months ago (leaving a scar on her face) because she was under the influence of some pill. She thinks she is a lesbian, and her degenerate friends are all lesbians. This girl is only 15 years old. In the past, I’ve tried to teach them things regarding Christianity and even shown them scripture, but I’m afraid any influence I used to have on them has been completely obliterated due to time, separation, and my brother’s slanders against me. My nephew is doing better, but even at 8 years old he could still not read. My niece is little different. If she does think, her thinking is given almost entirely to evil. Because my brother despises me, I’m afraid I have no access to her to solve the problem. 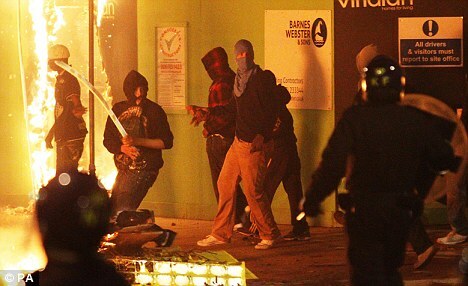 By the way, there have also been riots in the U.S. as well over the past few months. I’ve been reading news articles about mobs on DrudgeReport for ages now. Yes, I’ve been reading about our own mobs, too, now. At least our police are not quite as hamstrung in doing what needs doing to restore order as Britain’s.